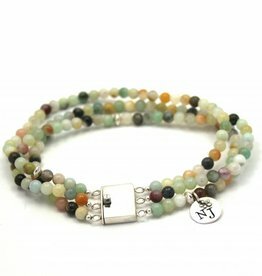 Handmade gemstone bracelets in several shades of khaki green. The sterling silver details are the finishing touch in our jewelry. More about gemstones. Do you have a specific question about gemstones? Ask our graduate gemologist Laetitia. Handmade bracelet of unakite and rudraksha with sterling silver details, designed by NJAmsterdam. Handmade bracelet of picture stone jasper. Green/beige jasper with tiger print and sterling silver details.